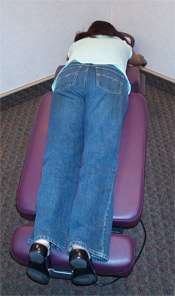 Named after its developer, Dr. James Cox, Cox Flexion-Distraction is a highly-effective technique that combines biomechanical principles with a gentle chiropractic approach. An ergonomically-designed table is used to flex and distract the spine, separate the compressed spinal joint and discs, and move them through a more normal range of motion without pain. This action reduces pressure on the facet joints of the spine, thus offering a conservative resolution of low back and leg pain that often averts the need for pain medication or surgery.